What a weekend it has been for Irish football. There are many questions that linger. And changes that are needed. We need new leaders to emerge. Fresh faces ready to put their hands up and really take control of the road ahead. Evidence of assertiveness and confidence that can allow us to look to the future with real belief. Old problems will not go away unless individuals emerge with the ability to provide the solutions. 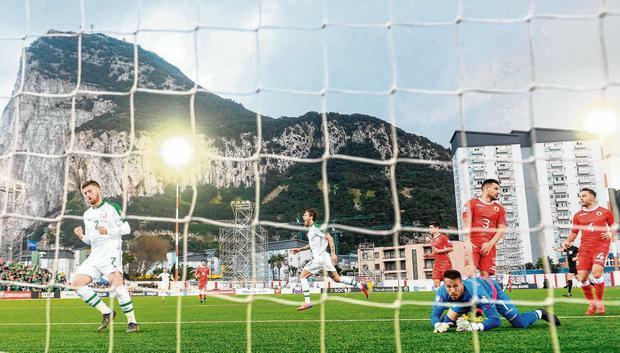 These are comments that could equally apply to events both on and off the pitch in Gibraltar on Saturday. The movements of John Delaney and the rest of the FAI board during the game provided a distraction from the struggles on the pitch. With supporters digesting speculation that was doing the rounds, there were phases of the match where the activity around the Victoria Stadium was more entertaining than the football that was being played. 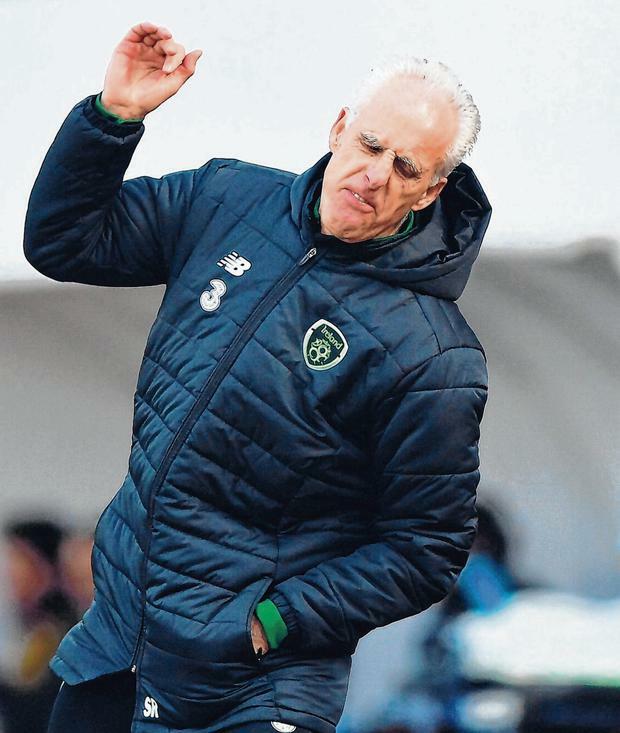 It was a grind for Mick McCarthy and he didn't attempt to sugar coat it afterwards. 'Horrible' was the description of his feelings during a windy 90 minutes where Ireland toiled against the 194th ranked side in the world. The artificial pitch and howling gales added another layer of difficulty. But McCarthy was also worried by some things that weren't working, and he hasn't exactly got a huge amount of time to work with the group ahead of tomorrow's clash with Georgia at the Aviva Stadium. Yesterday was a recovery day for the Gibraltar participants, so the only full training session with the group will be today. "Not a lot" was McCarthy's response when asked what scope the tight turnaround left for proper work. This poses him with a dilemma. He acknowledged that the solution to the Seamus Coleman and Matt Doherty problem ultimately didn't work. Doherty was uncomfortable on the right side of midfield where he didn't have the space to thrive, which is a feature of his success at Wolves. McCarthy has not ruled out trying it again, yet he did not appear overly enthusiastic about giving it another bash against the Georgians. "I'm not going to dismiss it," he said, "And perhaps with more than five days to look at it, it might be a different scenario. "I was looking for more. But I'm not sure it changed that much when I changed the 'Doc' to be quite honest, whether Robbie Brady (his replacement) couldn't get on the ball or they were just making a bit more of a game of it." Doherty did look frustrated at times, but McCarthy - who brought the Dubliner to Wolves - is used to the 27-year-old's body language. "I think he always plays like that," he said. "He's a good footballer for them [Wolves]. It's a different way. "Maybe there is more room on the pitch when Wolves have got it; they're more expansive. They've been doing it for two years, they've been brilliant. "I'm not going to knock Doc's performance. He had a little bit of joy in the first half and Seamus doubling up. Other than that, it didn't work, so there was a substitution. "I'm not saying he played badly in the game - he didn't do anything wrong in the game - I was just looking for a few more crosses, I guess. "It wasn't a rip-roaring success in terms of how much we've got out of it. "I'm not giving the Doc any grief. I chose to play him there and he did what was asked of him. "But we didn't get that much from anybody else, to be quite honest. And I have to say I put that down to them as well." The search for positives did draw upbeat answers. One of McCarthy's big calls was to go with Conor Hourihane as a central partner for Jeff Hendrick, with the Corkman preferred to Glenn Whelan and Harry Arter. He was satisfied with the contribution of Hourihane and Hendrick, with the latter delivering the only goal. "The two midfielders, I thought, played very well," he said, "I thought Conor was excellent. David McGoldrick, I thought he was very good. And I know all of the others scrapped away like I expected." Hourihane's Irish career never really took off under Martin O'Neill, yet this week has given him the opportunity to take a central billing in the new regime. "He's a good footballer, Conor. I always admired him," continued McCarthy. "When he was at Barnsley, I was looking to sign him but I'd no chance. "I think he's got a lot to offer. His free kicks and corners were terrific... he's got good delivery; he's a good player." Whelan was brought back with a job in mind, but the question now is if a home game with Georgia really ticks the box. Under O'Neill, Ireland found it hard against the Georgians and they were outpassed at the Aviva Stadium in a fortuitous win in October 2016. If Ireland are looking to apply a bit more control in terms of possession, then another twist for Hendrick and Hourihane would be the positive solution. Whelan might be a better fit for Denmark in June as a shield. Arter is an eager player that likes to press the opponents, but he toiled in Tbilisi last time around. Hourihane is more composed, yet he also covers a fair bit of ground too and he has probably earned full involvement in a match of substance in Dublin. Elsewhere, Richard Keogh's selection ahead of John Egan was the percentage call if McCarthy was going with a back four. Egan would be the form shout, as he is thriving at Sheffield United. But they play with a three-man defence. There is a compelling case for Ireland going that way in light of the Coleman-and-Doherty conundrum and the benefits of getting two strikers on the pitch to avoid a scenario where Sean Maguire is isolated. It would be a challenge, though, to switch to that system in the middle of a double header with limited scope for practice. Personnel matters tend to dominate debates around change, yet some of Saturday's deflation was borne from players going backwards or from side to side without any real invention or purpose. Slow passages of play did bring back memories from 2018, but the circumstances of the match offer some explanation. The task for McCarthy is to find a short-term solution that delivers the answers. Like his superiors, he might just be happy to get this week out of the way.